Preheat the oven to 425 Fahrenheit and line a baking sheet with foil and parchment paper. Lightly whisk the egg white. Mix the almond flour, shredded coconut, and grated ginger together on a plate. Cut each apple in half and remove the core. Dip the cut side of the apple into the egg white, then press firmly into the almond/coconut mixture. Make sure the whole cut surface of the apple is coated, including the cavity where the core was. Place the apple on the baking sheet. There should be just enough almond/coconut mixture to coat all the apples with none to spare. Drizzle with a tiny bit of coconut oil (or olive oil or macadamia nut oil - whatever you have). Bake at 425 for 30 minutes. Remove from the oven and place 1/2 T of date glaze in each cavity. Bake for 3 minutes more. Serve! 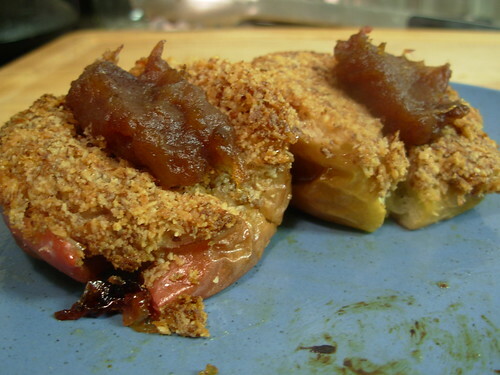 Apples (minus date glaze) inspired by "Low Carb High Flavor Recipes Made Easy" by Fiona Carns. Put the dates, water, and cardamom in a small saucepan and bring to a boil. Simmer for 10 minutes until thick and mostly smooth, adding a tablespoon or two more water if necessary. Remove from the heat and stir in the vanilla. Date glaze inspired by Moosewood Restaurant New Classics by Moosewood Collective. I have found my dessert for tonite! Thanks!!! I'm so glad I found your blog! I started eating paleo a month ago and love cooking & baking. I went apple picking last weekend and have so many apples to use -- I'm making this tomorrow! Thanks!! Just wanted to post again and say I did make this recipe and it's delicious!! I've also made it with peaches -- I added cinnamon to the crust and instead of the date glaze, poured 2 TBS of coconut milk over it. YUM! Just tried this recipe - these were really amazing! Thanks for the share. It was very interesting and informative. Keep posting. I follow you.